Seven tourers met at the Martello Tower this morning; five were going to Horam but the other two decided to head for Newhaven ferry port and hop across The Channel to Dieppe to do a short tour of Upper Normandy. The sea was like a mill pond so they should have had a smooth crossing. I wrote about channel hopping to Dieppe in the latest issue of the Cycle Seahaven newsletter (seahaven cyclist). We are fortunate to have a ferry port on our doorstep; Dieppe is only four hours away. 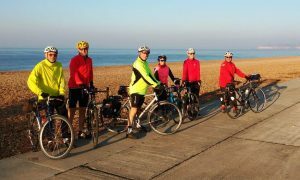 Next year Phoenix-CTC is aiming to have several cycling trips to France using the Newhaven-Dieppe ferry starting with a Dieppe Channel Hopper over the May Day bank holiday weekend. As for the other five, we had a very pleasant ride to Horam using a slightly modified route to the norm. The touring ride next Sunday will be to Heathfield. I wonder if anyone will hop across the Channel instead! Whilst Clive was taking some Seahaven riders along the Loire Valley, four members from the Touring Section went on a five-day mini tour of Normandy in early September, the total distance cycled over the five days was 260 miles as a round trip from Seaford, utilising the Newhaven to Dieppe Ferry. The aim was to introduce new tourist members to unsupported cycle touring, avoiding busy roads and where possible riding some of the many “Voie Vertes” or green routes. 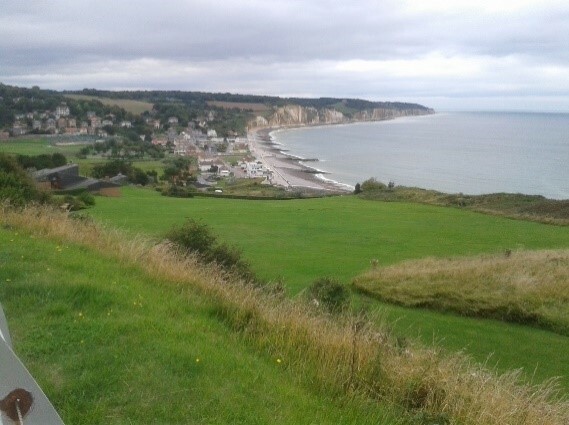 Day 1 Dieppe to St Valery en Caux 29.2 Miles (17 miles on car free cycle routes) 1368 ft of ascent. 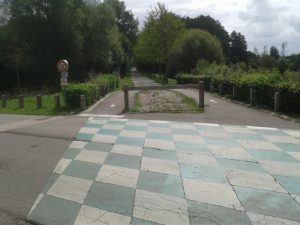 A short ride from Dieppe took us to the Veloroute du Lin, a former railway route that has been converted to leisure use, similar to the Cuckoo Trail. This just left a few short miles on quiet roads to St Valery en Caux. Day 2 St Valery en Caux to Honfleur 53.2 Miles 1647 Ft of Ascent. All on Roads. 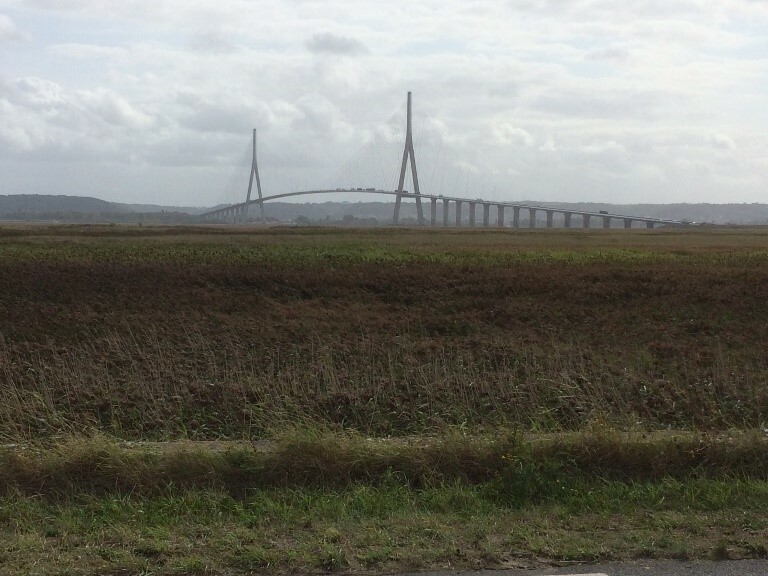 A quiet back lane route on the most part took us to Honfleur, highlight of the day was crossing the Pont de Normande by bicycle. Honfleur is a medieval port, with a fascinating history , it has a bustling centre with many with many bars and fish restaurants. Another disused railway cycle route (Eure 2 Voie Verte) took us off road from Pont Anthou to Evreux, through the heart of the Normandy Countryside. Day 4 Evreux to Gornay en Bray 61.3 Miles 1851 Ft of Ascent 21 Miles on Traffic Free Cycle Routes. 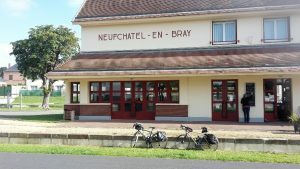 It was time start heading back to the Channel, our destination town for the longest day of the trip, Gornay en Bray, familiar to those of you who have cycled the Paris -London route. Once over the River Seine river we cycled past the coach loads of tourists at Monet’s Garden, which looked pretty with the late summer roses in fine bloom. We picked up the Eure 4 Voie Verte de La Vallee de La Epte another former railway line which merges with Avenue Vert at Bray et Lu. This particular route finishes at Gisors. We followed a route close to the Avenue Vert as far as Forges Les Eaux (Heathfield’s Twin Town), where we picked up the former railway line that drops all the way into Dieppe. 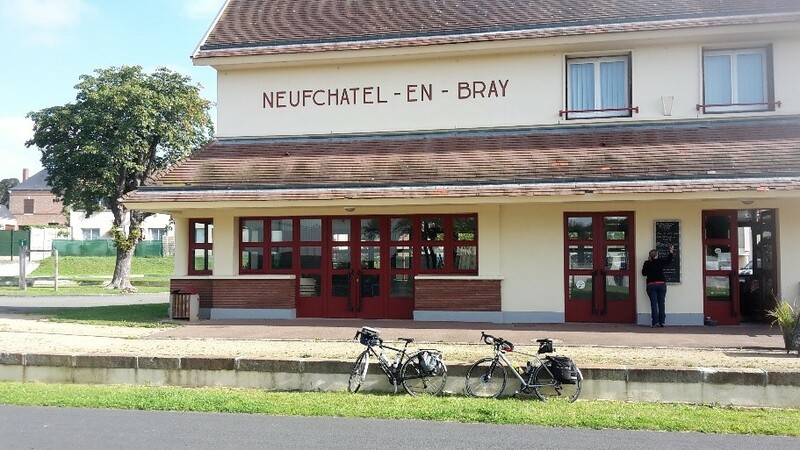 We stopped for refreshments at Neufchatel en Bray, in the former railway station that is now a café. Good company and a Garmin GPS with back up navigation methods. Choose a town centre hotel for Evreux. Photos Dave Sutton, Joe Hamilton, Phil Draude and John Buchan. Cycle touring in France is always a pleasant experience and, as we live on the south coast of England, it makes sense to pop across the Channel now and again to indulge in our pleasurable pursuit on the right hand side of the road! Three months ago four of us from Cycle Seahaven channel hopped to Dieppe for three days cycling in the Seine-Maritime department. We’ve now followed this up with a trip to one of the best regions in France for cycling, the Loire Valley. It’s reasonably flat, there are lots of signposted cycle routes, chateaux to admire, plenty of cafes, not to mention the fine wines of that region. However, to get there by bike you have to cycle through Brittany or Normandy although for those who are used to cycle touring it all adds to the pleasure of cycling in France. 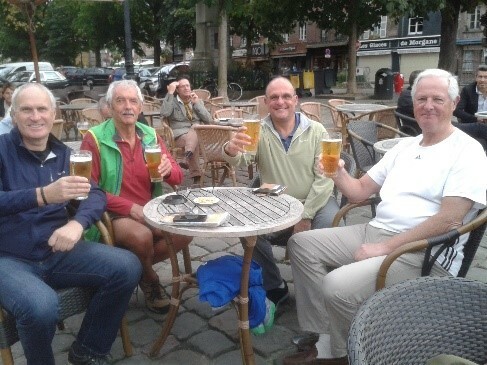 So, with that in mind, four of us from Cycle Seahaven joined eight other cyclists from Phoenix-CTC at Portsmouth ferry port recently to catch the night ferry to St Malo where our week-long cycle tour began. We cycled through Brittany to Angers in the Loire Valley which included an overnight stop at Vitré in Brittany en route. 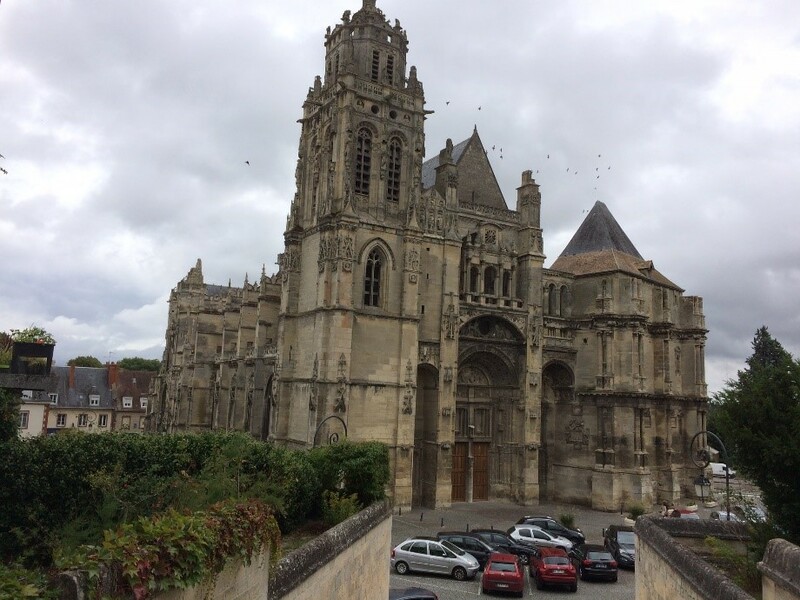 Then, we had two full days of cycling in the Loire staying overnight at Chinon and Tours before heading back to the Channel through Normandy. This included hotel stops at Le Mans, Bagnoles de l’Orne and Ouistreham from where we caught the ferry back to Portsmouth. It was a great seven days of cycling, 420 miles, not to mention the highly convivial evenings in the local restaurants. Our only disappointment was that it was over too soon. Perhaps next time we’ll spend longer in the Loire Valley! Whilst we were on this trip four other Cycle Seahaven cyclists were also in France touring in Haute Normandie. 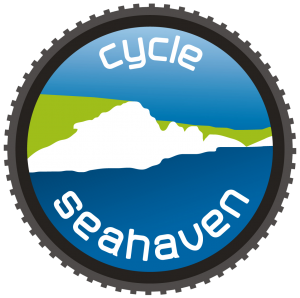 Dave Sutton has added details and photos on the Cycle Seahaven Facebook page. Time to start planning a return visit to France, I think! Four of us from Cycle Seahaven hopped across the Channel with three other cyclists last Friday to take part in a cycling trip organised by Phoenix-CTC, a member group of Cycling UK. We stayed at the Hotel de la Plage, a hotel I’ve used many times on cycling trips. There’s always a warm welcome, the staff are friendly and helpful, good rooms, excellent buffet breakfast and there’s a garage for the bikes. Also, it’s in a good location, being on the boulevard along the seafront and close to the town centre; the marina is nearby where there are cafés and restaurants aplenty. We stayed at this superb hotel for three nights which gave us three full days of cycling through the countryside of Seine-Maritime. It’s a great place for cycling as the country roads are very quiet and in excellent condition; potholes are a rarity! Also, the French drivers are very considerate towards cyclists and allow plenty of room when passing. The only time a car came close to me turned out to be British. I have to say that much as I enjoy cycling through the countryside of Sussex, cycling in Seine-Maritime is bliss! Cycle Seahaven members will be aware of the Avenue Verte, the London to Paris cycle route which includes the Cuckoo Trail and, of course, comes through Seaford and Newhaven and, includes the ferry crossing to Dieppe. Lesser known, I suspect, is the Veloroute du Lin which starts just outside Dieppe and follows a disused railway line for about 15 miles to St-Pierre-le-Viger, just a few miles short of St-Valery-en-Caux. It’s well worth cycling along. 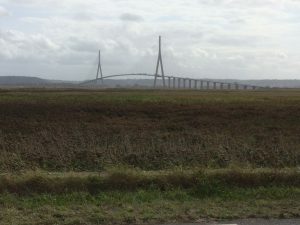 We cycled along it on our way to St-Valery. Fantastic! Most of the surface is virtually billiard table smooth so the bikes just roll effortlessly along it; the surrounding fields were full of pale blue linseed wafting in the wind and the hedgerows and banks were full of wild flowers. Great cycling! The Veloroute du Lin will eventually be extended to Fécamp making it a 50 mile shared use cycle path. Of course, no trip to Dieppe would be complete without a short spin along the Avenue Verte so we rode along it from Neufchatel-en-Bray back to Dieppe, about 23 miles. There’s a very gradual descent for most of the way so it made for easy cycling. All in all this was a great three days of cycling not to mention the highly convivial evenings in the local restaurants. If you like touring through the countryside then I can recommend channel hopping to Dieppe. If you’re a member of Cycling UK (previously the CTC) and like cycling in France then you may be interested in a Dieppe Channel Hopper being run in June by Phoenix-CTC of which I’m chairman. 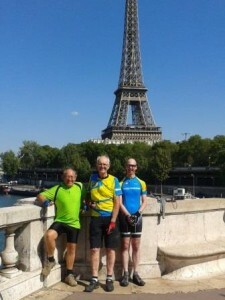 Phoenix-CTC is a member group of Cycling UK and our cycling trips are usually in France. At present there are seven cyclists going on this trip; four of us are members of Cycle Seahaven. If you’d like to join us or would like more information then please use the contact form on the Phoenix-CTC website. You must be a fully paid up member of Cycling UK to go on this trip. 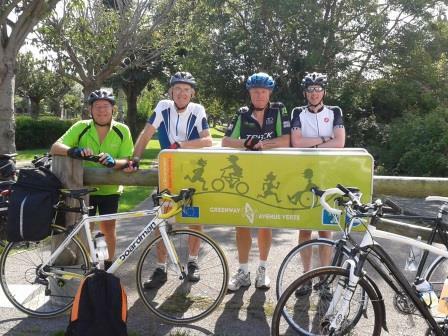 It’s great to see increasing numbers of British cyclists using the Avenue Verte between London and Paris. Ten years ago it was a rare occurrence to see a Brit cycling along the original 43 km (27 miles) section of the Avenue Verte between Dieppe and Forges-les-Eaux. However, in 2012 a cycle route called the Avenue Verte, which included the original section, was signposted between the British and French capital cities. Perhaps not surprisingly, this appears to have caused the surge in numbers. Last week four of us from Cycle Seahaven, Joe Hamilton, David Tyler, Derek Thorne and me cycled from Dieppe to Paris and back on a route loosely based on the Avenue Verte. We rode on the original section and I was amazed to see more British than French cyclists riding along it. Admittedly, there was a charity ride on our return trip but there were still plenty of other British cyclists using it, often in small groups like us. The Avenue Verte is certainly getting popular! We chose to short-circuit the Avenue Verte about halfway to Paris to reduce the distance, partly because we were travelling with panniers so inclines were hard work but also because I knew that some parts of the signposted route need improving. Our trip started with an evening crossing on the ferry from Newhaven to Dieppe where we stayed overnight at the Hotel de la Plage. Next morning, after a good breakfast, we set off to cycle about 80 kms (50 miles) to Gournay-en-Bray almost entirely along the signposted Avenue Verte route. 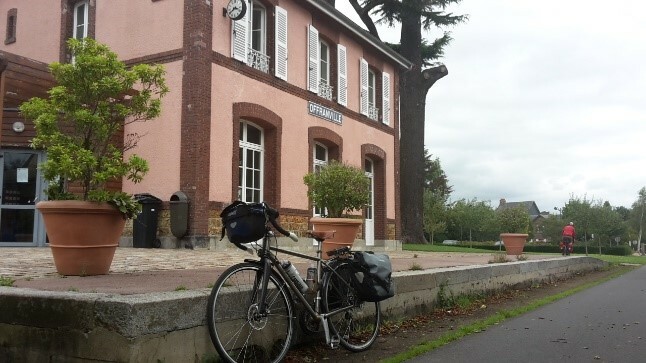 In Gournay we stayed at the Hotel le Cygne (super evening meal and breakfast) and next morning set off to cycle a similar distance to Cergy Ham, just south of but avoiding Cergy Pontoise. After a few miles of cycling we were surprised to come across a newly constructed section of the Avenue Verte. This is a shared use path along a disused railway line between Gournay and Beauvais and, just like the original section to Forges-les-Eaux, is several metres wide and has a tarmac surface which is as smooth as a billiard table! It’s good to see the Avenue Verte being improved; I was quite critical about some parts of it in my Review of the Avenue Verte last year. 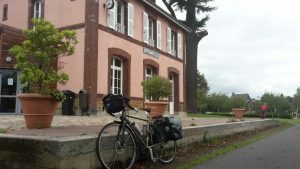 At Cergy Ham we stayed at the Hotel Au Week-End for two nights which meant that we could leave our panniers there whilst we spent the next day cycling to and from Paris, a round trip of about 70 miles. We entered Paris via Versailles, through Parc St Cloud and the Bois de Boulogne and made a beeline for the Eiffel Tower. (This is an entirely different route to the Avenue Verte which finishes at Notre Dame). We only spent a couple of hours in the centre of Paris but long enough to have an excellent lunch at the Café du Trocadero. Our return route to Dieppe over the following two days was modified so as to include a large part of the new section of the Avenue Verte between Beauvais and Gournay. It’s superb; must use it next year in a trip to Paris. Now that the ferry has been saved, more cycling trips to Paris are possible! Since posting an item on the blog a week ago ‘Last Chance to Channel Hop to Dieppe’ it’s been announced this week that the Newhaven – Dieppe crossing will continue after the end of this year. That’s good news for Newhaven and the people who work on the ferry; also it maintains the vital sea link in the Avenue Verte cycle route between London and Paris. The Syndicat Mixte de Promotion de l’Activité Transmanche (SMPAT) will run the service from 1 January 2016. (The SMPAT is comprised of the Departement de Seine-Maritime, the city authorities in Dieppe and Dieppe Chamber of Commerce). It says that it will continue to subsidise the route, but in the long-term is seeking to reduce the cost to the French taxpayer by attracting more investment from external partners. The two vessels serving the route will be rebranded, but DFDS will continue to handle bookings and marketing until the end of March 2016, to ensure a smooth transition. So, although there may not be the same urgency to hop across the Channel, an Autumn cycling break based in Dieppe still sounds like a good idea. We’re lucky to have a ferry Port on our doorstep, so to speak, as France is only a four hour ferry trip away. Dieppe is arguably the most attractive of all the French channel ports and the surrounding countryside is ideal for cycling. The country roads tend to be quieter than on this side of the Channel, road surfaces are better (potholes are a rarity) and cycle paths are in far better condition. Unfortunately, there’s uncertainty over whether the ferry crossing will continue after this year. However, DFDS have two ferries on this route at present; there was only one until May. Presumably DFDS are trying to stimulate more business to make it worth continuing next year. Therefore, it’s a good time to take your bike across the channel. There are three sailings to Dieppe each day and the price is usually only £35 return with your bike. Those over 60 years of age get a 20% discount if they buy their ferry ticket at the ferry terminal in Newhaven. This offer is not available online. 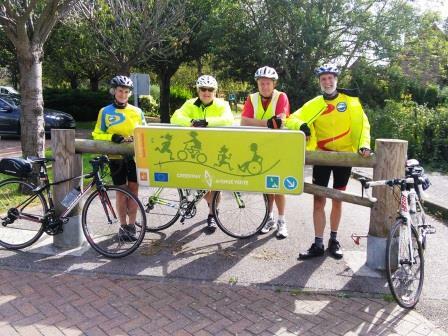 Last September, six of us from Cycle Seahaven hoped across the channel to Dieppe and had a very pleasant weekend of cycling in the Seine-Maritime department, see Channel Hopping to Dieppe. Recently, I stayed in Dieppe on a Phoenix-CTC event and visited some different places such as Mers-les-Bains (Art-Nouveau buildings along the seafront), St Valery-en-Caux (an attractive place with a fishing port and marina) and cycled along a new cycle path, Veloroute du Lin. It was opened earlier this year and starts at Pourville-sur-Mer, a few kilometres west of Dieppe, and continues for about 25 kms to Saint-Pierre-le-Viger which is about 10 kms from St Valery-en-Caux. Eventually, the cycle path will be extended to Fecamp. There are certainly plenty of interesting places to visit in the Seine-Maritime area of France, not to mention cycling along the Avenue Verte! It’s well worth a visit. There’s a good choice of accommodation in Dieppe; I usually stay in the Hotel de la Plage which is cycle friendly and has a garage for bikes. Also, there’s no shortage of bars and restaurants in the town; many are by the marina. It’s a great place to be based for a cycling break. Hopefully the ferry crossing will continue but, in case it doesn’t, it may be worth hopping across the Channel with your bike within the next two or three months. Fancy some cycle touring in France? If you’re a member of the CTC then you have the opportunity to do this with Phoenix-CTC, as explained in my previous post on this subject ‘Cycle Touring in France with Phoenix-CTC’. There will be three cycle events in France this year, starting with a channel hopper to Dieppe in early May. You can find more details of these events at www.phoenix-ctc.org.uk. If you’d like to enter any of them then you’ll need to be quick as the closing date for entries is Thursday, 15th January.